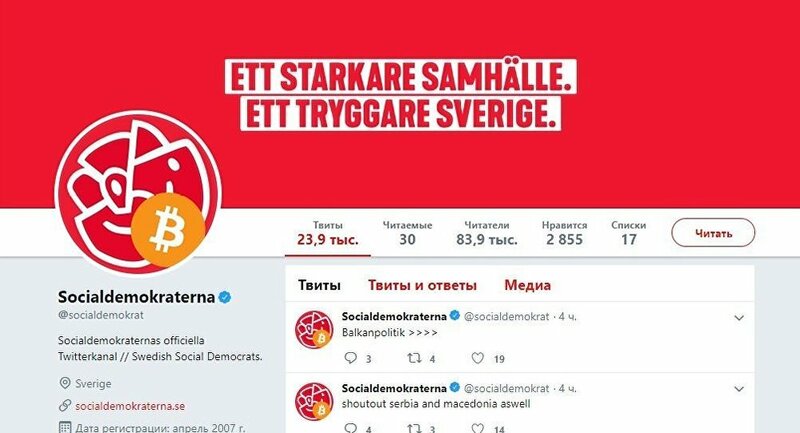 Strange tweets began to appear on the Social Democrats' account at about 2 o'clock in the morning on Monday. Over the next several hours, over 20 tweets were sent out on an array of topics, including cannabis getting legalised and Prime Minister Stefan Löfven retiring. "We have now decided to abolish the Swedish Air Force and instead invest in immigration and those in need!" the hijacked account elaborated in a tongue-in-cheek mockery of the left-leaning Social Democrats' politics. The Twitter account also informed that cannabis now was legal and that Prime Minister Stefan Löfven, unceremoniously called 'Steffe', had quit his post to join the military as a lieutenant. A photograph of Löfven driving a tank was added. "Of course nothing we support, there are some really serious things out there," the Social Democrats' press communicator Åsa Söderén told SVT. Founded in 1889, the Social Democratic Party is Sweden's oldest and largest political party. Having ruled the country for most of the 20th century, the Social Democrats polled a historic low in the 2018 general election, falling below 30 percent amid widespread criticism over allegedly eroding the country's welfare and being overzealous with immigration.